I’ve been aware of La Gelatiera and its Victoria Arduino lever espresso machine for a little while now, ever since I visited the nearby New Row Coffee (now The Espresso Room) at the start of last year. However, what caught my eye when I was wandering by at the end of May was the sign in the window offering two espresso blends from Terrone & Co! Intrigued, I headed inside. You wouldn’t describe La Gelatiera as big. It’s a similar size and shape to The Espresso Room (which is two doors down) with a similar layout. A rectangle, with the long side facing the street, the front is all glass, windows on the left, door on the right. Inside, the back of the store is occupied by the counter, which runs almost the full width of the store, ice cream front and centre, with the coffee tucked off to the left. There’s a somewhat chaotic arrangement of tables for those who want to sit in. Ahead and to the left of the door is a two-person table, effectively delineating the tables (off to the left) from the queue for the counter (dead ahead).There’s a larger table in the window, another by the left-hand wall and, finally, a small one at the front on the left by the espresso machine, which, while I was there, was very hot! There’s one more seating option. Starting about halfway along the right-hand wall and extending to beyond the end of the counter, runs a four-person bar. It’s not ideal since your back’s to the rest of the room and, typically, the queue for the counter is just behind you. La Glelatiera’s main draw is ice cream, although if you have a sweet tooth, there’s also cake, crepes, pancakes, waffles and Kokoa Collection hot chocolate. During my visit, I counted 18 flavours, all of which you can try before you buy. I ended up with strawberry cheesecake plus apple crumble and, while I wasn’t that taken by the apple crumble, the strawberry cheesecake was amazing. The ultimate test is the coffee. La Gelatiera moved to Terrone & Co about a year ago, serving espresso-based drinks from a standard menu. There’s a choice of two blends, the darker Guglielmo blend and the medium-roast Terrone Blend, which I tried. 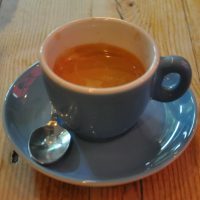 I had an espresso and was rewarded with a lovely, well-balanced shot, which had plenty of body, although since I’d just been gorging myself on ice cream, it was rather hard to pick out anything more subtle than that! While there are plenty of other speciality coffee options in the area, La Gelatiera is an excellent choice if you want ice cream, etc, with your coffee (or if you want coffee with your ice cream, etc). It’s also a great late-night option, staying open until 11 o’clock in the evening. This entry was posted in Cake, Central London (West), Coffee Shops, Evening Opening, Ice Cream Parlours, Laptop Friendly, Late Opening, Saturday Short and tagged include, Terrone by Brian Williams. Bookmark the permalink.